Never let it be said that Bo Pelini, head coach of the Youngstown State Penguins, doesn’t know how to make great copy. The Jackrabbits travel to Youngstown Saturday night to take on the No. 5 team in the nation, and as Bo knows, the potential of a an epic football game is in place. Front and center is the Jackrabbits’ high-powered passing offense, against a Youngstown State defense that has allowed only 111 passing yards per contest this season. Both teams are confident, South Dakota State 3-0 after thrashings of Drake and Duquesne, while Youngstown came within a whisker up upsetting Pitt, losing only 28-21. WR Jake Wieneke will test Youngstown, who seems to have few weaknesses across the board, and it simply feels like the better tested, and tougher team, will take what should be a great game. No. 22 Albany at Elon. “I circled this September 30th matchup between Albany and Elon back in March as a key game in the CAA schedule,” said nobody in the month of March. This matchup of the CAA’s two biggest surprises comes on the heels of both teams upsetting Top 25 schools last week. Let’s get this out of the way now: behind the running of RB Malcolm Summers, I’m officially a Phoenix believer now. Phoenix 27, Great Danes 14. Missouri State at No. 2 North Dakota State. The Bison cupcake brigade continues – this time, in the Missouri Valley. Bison 40, Bears 6. No. 11 The Citadel at No. 23 Samford. What do we got with these teams? Both of these SoCon squads have underwhelmed in the early going, The Citadel struggling against East Tennessee State and Samford losing a heartbreaker against Western Carolina last week. Thinking desperation might win the day here. Samford Bulldogs 30, The Citadel Bulldogs 24. No. 1 James Madison at Delaware. A deep reality check awaits Blue Hen fans that think wins over Delaware State and Cornell in any way prepare them for what’s about to invade the Tub. Dukes 48, Blue Hens 3. No. 18 Weber State at Montana State. Are the Bobcats back? After a business trip to North Dakota to get their mojo back, Montana State now welcomes Weber State to town, the Bobcat’s third straight game against a nationally-ranked opponent after they opened the year against Washington State. My hunch: Yes. Bobcats 34, Wildcats 28. No. 10 South Dakota at No. 16 Western Illinois. Home of the “Chopped Liver” bowl, it must rankle Leatherneck fans that this battle of unbeaten Missouri Valley teams has been somewhat upstaged by the Scrape in Youngstown. While it lacks the star names, though, it is going to be a whale of a matchup. Coyotes 31, Leathernecks 28. Clark Atlanta (D-II) vs. No. 21 Grambling State, Chicago Classic, Chicago, IL. Playing in front of one of the school’s largest alumni bases before getting back into conference play, Grambling head coach Broderick Fobbs said of this HBCU Classic game that the Tigers are trying “to get closer to who the team needs to be.” Let’s translate the coach-speak: This will be a bloodbath. Tigers 49, Panthers 9. Sacramento State at No. 8 Eastern Washington. E-A-G-L-E-S Eagles! Eagles 55, Hornets 17. Bryant at No. 14 New Hampshire. Credit goes to Bryant this season in upgrading their schedule with a slew of contending Eastern FCS teams like Fordham, Maine and now New Hampshire. Though the Bulldogs are starting to figure things out, winning in the Dungeon is a different matter entirely. Wildcats 55, Bulldogs 17. No. 13 North Carolina A&T at South Carolina State. At some point, one has to ask oneself if the Aggies might be headed towards an undefeated season. Two road games stand out as their biggest roadblocks: the season-ending game against NC Central, and the game this week vs. the Bulldogs. I’m going to take a chance that the Bulldogs are desperate, upset, and need this game more. Bulldogs 32, Aggies 30. No. 17 Villanova at Towson. Banged-up Villanova heads to Towson, who is wondering how they can get into the Albany/Villanova/CAA Darling club. Beating thw Wildcats would be a start, but I think the Wildcats will bounce back here. Wildcats 24, Tigers 17. No. 21 UT Martin at Austin Peay. 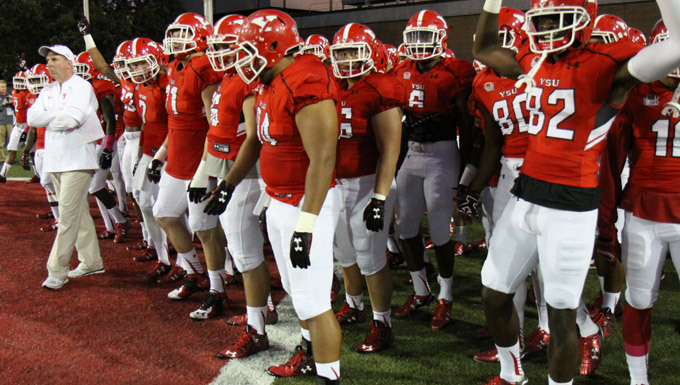 The Skyhawks are for real, and while Austin Peay’s winning streak is one of the feel-good story of the FCS this year, this step up in class is way too much. Skyhawks 63, Govenors 20. No. 3 Sam Houston State at No. 12 Central Arkansas. Any other week, this game would be a very strong contender for FCS Game of the week – one of the few spots where the Bearkats might be ripe for an upset. But if this game gets to a shootout between Jeremiah Briscoe and Hayden Hildebrand – and every indication is that it will – it’s hard not to see Sam Houston emerge with the W. Bearkats 42, Bears 41. No. 25 McNeese at Stephen F. Austin. Weird stat of the week: In the last four meetings between these two schools, the away team has won. Make it five. Cowboys 34, Lumberjacks 28. No. 7 Wofford at Presbyterian. Unlike most of Wofford’s games in the past few weeks, this one won’t be close. Terriers 40, Blue Hose 3. Eastern Illinois at No. 21 Tennessee State. How will the Tigers rebound after their first loss of the season? Against rebuilding Eastern Illinois, just fine. Tigers 30, Panthers 13. No. 5 Jacksonville State at Tennessee Tech. Entering league play after a successful, challenging non-league slate including a dominating win over Liberty, the Gamecocks start their OVC title defense showing exactly how powerful they are in conference play. Gamecocks 41, Golden Eagles 10. No. 20 Northern Iowa at Southern Illinois. Fresh off a bye week is probably the last place the Salukis will want to see Northern Iowa this week, who both need a win to have a prayer in the brutal Missouri Valley conference schedule ahead. Give me Southern Illinois in a mild upset. Salukis 33, Panthers 27. Indiana State at No. 8 Illinois State. Will the Sycamores score a point? Perhaps a few. Redbirds 27, Sycamores 3.